We believe that all children of all backgrounds and circumstances, regardless of ethnicity, race, religion, gender or disability deserve to be in an environment that is safe, healthy, happy and conducive to learning. We believe that all children learn differently and at their own pace. Heartland Kids Early Leanring Center is a distinctly child-oriented environment designed to support individualized attention to each child's unique learning style and pace. Our commitment is to create and maintain appropriate, l thought-out, beautiful spaces that promote each child's social, emotional, cognitive and physical development, using an educational program that is based on sound principles of child development. 1. Provide a safe, healthy and quality learning environment. 2. Attract and accommodate the needs of well-qualified staff. 3. 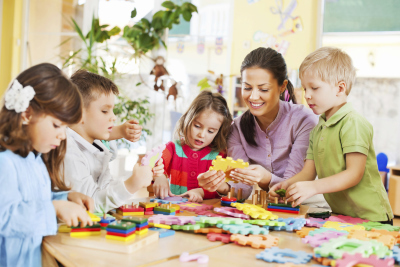 Provide a quality early childhood education promoting skills required for entering Kindergarten. 4. Facilitate family involvement in the care and education of each child. 5. Promote physical well-being by providing nutritious food as well as period of rest and exercise. 6. Meet at least bi-annually with parents to report on progress or needs of each child. 7. Serve as a liason and resource to parents regarding the community and local school districts. 1. Confidence and a positive self image. 2. Compassion and respect for others. ​3. The skills required to function well in group settings. 5. Physical skills appropriate to each stage of development.